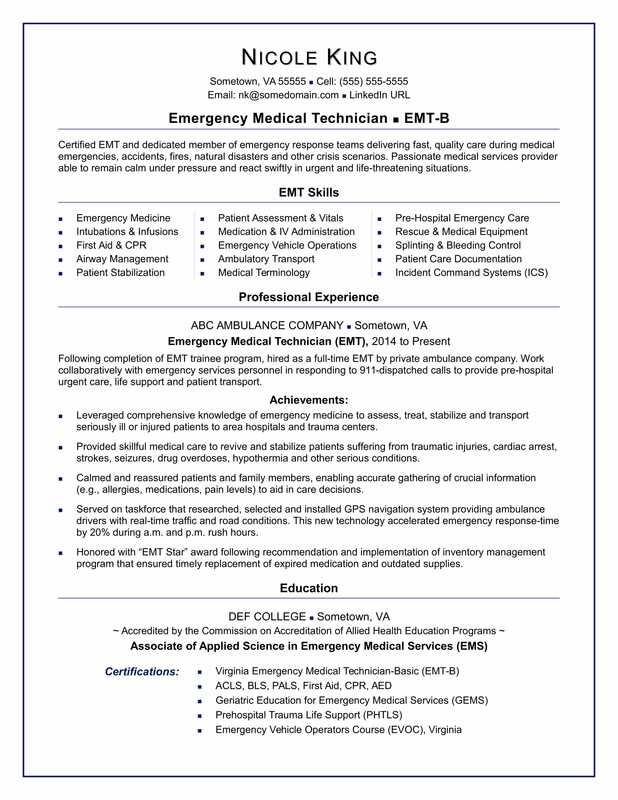 View this sample resume for an EMT, or download the EMT resume template in Word. Your skills are vital, so your resume should reflect that. To be considered for top EMT jobs, resume expert Kim Isaacs says it helps to have a comprehensive resume. For resume writing tips, view this sample resume for an EMT worker that Isaacs created below, or download the EMT resume template in Word. Jobs for EMTs are projected to grow by 15% (or 37,400 jobs) from 2016 through 2026, which is much faster than average, according to the Bureau of Labor Statistics (BLS). You'll find the highest level of employment for this job in the following states: Texas, California, New York, Illinois, and Pennsylvania; and in the following metropolitan areas: New York City, Chicago, Houston, Los Angeles, and Atlanta. As an EMT, you can expect to earn a median wage of $33,380 per year, or $16.05 per hour, according to the BLS. Additionally, you can learn about healthcare careers and search for EMT jobs on Monster. Certified EMT and dedicated member of emergency response teams delivering fast, quality care during medical emergencies, accidents, fires, natural disasters and other crisis scenarios. Passionate medical services provider able to remain calm under pressure and react swiftly in urgent and life-threatening situations. Following completion of EMT trainee program, hired as a full-time EMT by private ambulance company. Work collaboratively with emergency services personnel in responding to 911-dispatched calls to provide pre-hospital urgent care, life support and patient transport. Leveraged comprehensive knowledge of emergency medicine to assess, treat, stabilize and transport seriously ill or injured patients to area hospitals and trauma centers. Provided skillful medical care to revive and stabilize patients suffering from traumatic injuries, cardiac arrest, strokes, seizures, drug overdoses, hypothermia and other serious conditions. Calmed and reassured patients and family members, enabling accurate gathering of crucial information (e.g., allergies, medications, pain levels) to aid in care decisions. Served on taskforce that researched, selected and installed GPS navigation system providing ambulance drivers with real-time traffic and road conditions. This new technology accelerated emergency response-time by 20% during a.m. and p.m. rush hours. Honored with “EMT Star” award following recommendation and implementation of inventory management program that ensured timely replacement of expired medication and outdated supplies. As an EMT, you've got a variety of crucial skills under your belt—but maybe resume writing isn't one of them. Could you use some help with that? Get a free resume evaluation today from the experts at Monster's Resume Writing Service. You'll get detailed feedback in two business days, including a review of your resume's appearance and content, and a prediction of a recruiter's first impression. It's a quick and easy way to give yourself a boost so that you can land the best jobs out there.